I first became acquainted with the encaustic paintings of Dale Roberts at the Marshall Gallery in Scottsdale, Arizona. His work has a textural, luminous quality using layers of rich, vibrating color. His paintings are characterized by a contemporary quality rather than subject matter and the light in his painting varies from mid-day veils of fog to the glow of twilight. Due to the translucent nature of encaustic his work is nearly impossible to photograph (the best way to perceive the luminosity is via video which gives a more comprehensive glimpse of the refracted light). By fusing a distinctive compositional sensibility with a novel painting style Roberts has created a uniquely beautiful body of work. BRAD TEARE In my experience encaustic is a very demanding medium. Did you embrace encaustic because of the innate beauty of the luminous pigment or were there other aspects–either technical or aesthetic–that drew you to the medium? DALE ROBERTS The intrinsic beauty of the paint was and is very attractive. I was drawn to the vast range of application possibilities, everything from smooth and flowing to thick and encrusted. The quality of light passing through translucent layers and unlimited open working time were both aspects particularly suited to my temperament. BRAD The freshness and spontaneity of your work suggests you are an excellent draughtsman but having never seen your sketches until recently I was surprised at the accuracy of your sketches since the corresponding paintings are more loosely rendered. How do you decide how to abbreviate form as you work from your sketches to the final painting? DALE After analyzing forms and compositional elements through careful studies and preparatory drawings I discover the salient qualities that serve the aim of each encaustic that follows. Deeply understanding my subject allows for freedom when honing in on what is important visually. Successful painting is often the product of intelligent and even visceral editing. 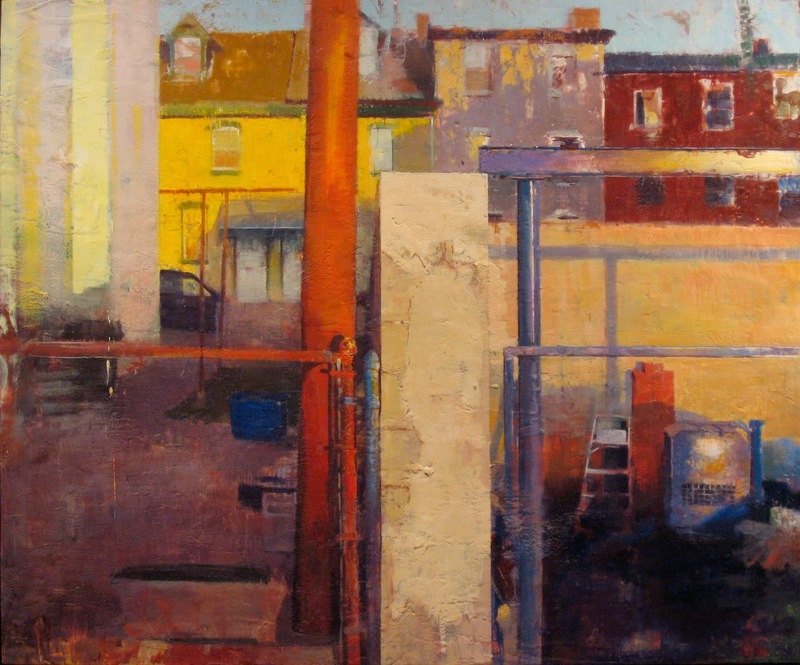 BRAD Your urban scenes, especially the paintings of bridges–which nearly constitutes a sub-genre of your work–have an abstract quality to them. Most artists concede that abstraction is the basis of composition yet not all artists express such a contemporary sensibility. Did you study abstraction? Have you ever painted purely abstract images? DALE During my years at art school, Rochester institute of technology and Tyler School of Art, I availed myself of a full range of study. I dove headlong into a deep immersion of figurative painting and the importance of craft as well as exposure and practice of the most contemporary abstraction. Both streams find their way into my present work. BRAD Is your compositional method a conscious one or purely intuitive? What formed your compositional methods? Were there specific theories or teachers that helped form those ideas? DALE Composition for me involves a kind of flirting with the boundaries- boundaries of forms, panel edges, divisions and compositional conventions. I will often make multiple preparatory sketches using a variety of mediums–editing, reworking, and sometimes reassembling them to arrive at the most effective result. The process is a combination of intuition and study. The main impulse is to keep the process–including work on the final panel–as fluid as possible allowing for changes from minor to cataclysmic whenever necessary. I’ve studied dynamic symmetry, episode and cinematic strategies, as well as compositional solutions throughout the history of art. Roger Anliker and Charles Schmidt both from Tyler advocated a wide range of compositional solutions with the salient principals being internalized for an intuitive response. BRAD How do you discover your motifs? Is sketching always a part of that process? DALE Since compulsive sketching, plein air Watercolor, Gouache and Pastel studies are my practice the motifs I paint are an outcome of that discipline. I also do a lot of mental composing when I’m not in the presence of the subject as well. BRAD Did the technical skills necessary to paint in encaustic come intuitively or did you struggle to become proficient? I've heard artists say they could never do woodcuts because their mind doesn't work that way–removing the negative space to reveal the positive. Are there certain gifts or traits that facilitate working in encaustic? DALE When I started working in Encaustic some 35 years ago, the training I had available was a brief discussion in the Ralph Mayer technical manual, my own stubborn ingenuity, and years of more or less successful attempts. It seemed that through that experience my own sensibilities began to fuse with the revealed character of the encaustic process. It’s come to the point where I think in those terms as I address a potential theme and subject. Early on the skills required were rather utilitarian, while later they assumed much more sophistication and specificity. I’m still in the practice of adding new approaches sometimes out of the pure joy of discovery. Encaustic does lend itself to a physical approach, and as the son of a carpenter, the building process of the medium was sympathetic to my aptitudes. BRAD From your videos I see you work from black and white sketches. Do you ever do a color study or do you rely on memory to paint color? Do you have a guiding theory of color that allows you get such beautiful color harmony in your work? DALE I do color studies from the subject in gouache, watercolor or pastel. Often I will paint several variations experimenting with the color intensity, value range and potential layers I might use. This practice has resulted in a trove of small versions of many of my larger encaustic compositions. In spite of all that planning, the painting ultimately has it’s own internal color character as it develops allowing the color studies and other notes to serve as a scaffold to launch from. BRAD Encaustics seem like a medium typically practiced in the studio. I was surprised you paint in the field on occasion. Is plein air painting an integral part of your process? How does your plein air process contrast with your studio methods? DALE Whenever the opportunity presents itself, the right combination of subject, electrical availability (for heating paints) and a sensible stretch of time, the prospect of plein air encaustic is wonderful. Working outside from life tends to elicit a decisive approach as I deal with the transient nature of light, weather or other unforeseen constraints. BRAD Is texture a conscious concern or do you let texture build as the layers require? Do you ever add anything to your paint, like chalk, to build up texture? DALE I suppose I can characterize my use of texture as a responsive one, both to the subject and to the paint film as it develops. I will use inert elements such as string, acid free paper, and occasionally marble dust to build texture and interest. My tools are a combination of studio and shop items which help me achieve the ends I have in mind. BRAD One of the surprising aspects of encaustic is that the paint can be reworked at any stage. How does this effect your process? Do you tend to work on one painting at a time or do you rotate each painting through multiple stages? How long does it take to paint one of your larger paintings? DALE Whenever I teach about a medium I will often begin with its application and then how to remove it. Understanding the medium/solvent aspect of any medium is crucial to working with a level of expertise and even abandon. The thermoplastic nature of encaustic is particularly freeing to me in that context. I am in the practice of working on as many as 11 paintings during a given studio season and even reworking something years later. My larger paintings, up to 6’ x 4’ might take a couple of years to come to fruition. BRAD I understand it is important to have good ventilation while painting with encaustics. Can you share what ventilation system you use or what might be adequate for the beginning encaustic painter? DALE I use two Honeywell HEPA units as well as fans and open windows. I’m careful not to burn the paint using a cooking thermometer to monitor the temperature at 205 degrees. Also there is no turpentine in my mixture, which I make by hand using beeswax and dry pigments. BRAD After watching one of your videos I bought a set of encaustics and found I really enjoyed the medium. One thing I was unsure about was the idea of fusing the layers, that is, applying heat to fuse the new layer into the lower layer. It seems that such a method blurs all of the hard won detail that might be in that layer. Any tips on how to fuse without losing detail? DALE I suppose working from general to specific has its merits when faced with a necessary step that can obliterate details accomplished in early stages. I’ve made and lost countless such moments on the way to figuring this process out. A tip for fusing without losing detail would be to heat it ONLY until the area begins to exhibit a shine, and then move the heat source away. BRAD If an artist wants to paint urban scenes it's necessary to paint chain link fences effectively. But painting chain link drives me crazy. Any hints how to paint such detail in encaustic? DALE One method is to paint the area behind the fence, and then score the lines for the fence into the film. Fill the void with the colors you want and then scrape away the excess using a razor blade. You might also invert that method, painting the fence first and then painting the background over it…scrape the film down to reveal the fence embedded in the image. BRAD You are an amazingly prolific artist especially since you worked a demanding day job for many years. How were you able to advance your painting career and hold down a 9-to-5 job? Are there any words of advice you might give artists pursuing a similar path? DALE In the inspirational words of a former professor The first MILLION are practice, and If you have 20 minutes you can do something wonderful. I will also add that to balance such a life an artist needs to understand that it’s about doing the good hard work, with discipline and consistency over time. Painting is all about the long haul, certainly not an easy road. BRAD I love your work and appreciate you taking time from painting to share your ideas and methods with the readers of Thick Paint. Many thanks! Amazing painter! Thanks for sharing this with us. Brad, I hope the sincerity comes across in this. Thank you. This was a special post. I've never heard of Dale Roberts. I read your post, watched the 30 minute video and was just standing beside myself for the opportunity to learn about an amazing artist out there and more about encaustic works. Truly, watching and learning about Dale makes me realize what a hack I am and how I'd love to be able to do more serious works. I'd also love to try encaustics some time as it seems the textural possibilities are so very rich and limitless. Each of the works featured here show the qualities of good design, composition, and mastery of technique and pigment application that results in a full sensory experience. While I've never seen his works in person, just looking at them here, it seems as if you can take in the whole and be moved, but at the same time get lost in the richness of variations in the textures and colors. Just wow. I've been moved. The sad thing is, for an artist of such quality, the video clearly outlines that without his day job and pension, he'd be hard pressed to make it economically. I find it so sad that artists all over our country are struggling to earn a living for producing (as Dale says it) lasting works of art. It really makes me very sad indeed. I thank you, Brad, for showcasing this artist and having the humility to showcase someone besides yourself and the influence they have in your own development and formation as an artist. Just wonderful! I really need to get in front of the easel and get away from the cotton candy I've been producing and focus more on making better quality paintings. Art is a journey of exploration and growth, right?! Glad you enjoyed the interview, Bob! I think Roberts' work is amazing. We live in hard times for artists–at least compared to the 90s. But it is encouraging to see people making amazing art even under difficult circumstances. I think your work is great! Don't be discouraged. I say that even though I often get discouraged. Like you I focus on growth rather than any other aspect of my art. I ask myself "am I growing?" and if the answer is yes that is good enough. Nothing else really matters. You're welcome, Brad. It really was a special treat! And thanks for your kind comments. I got some RGH Artist Oils today. I have to jump in front of the easel and start working on something spectacular and continue to grow! I do agree with you on that. In this market, I think all we can do is study, practice, GROW, and be patient that the market turns around. I hope you are well. Sorry I haven't been around much. Mom got re-married and doing some IT consulting has kept me busy. But I'm still here...lurking and reading and learning from what you share! I love that RGH paint! I got a tip the other day about keeping paint in cans from drying–store the can upside down. I will try it to see if it works. Glad you're back at the easel!